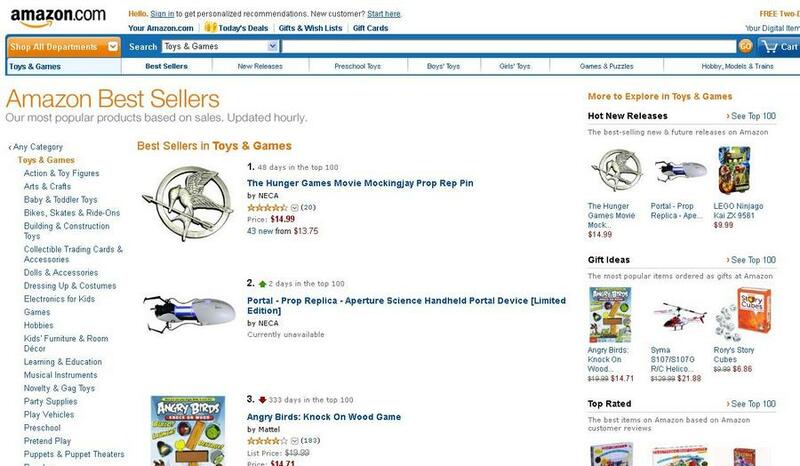 Two of our very own products, The Hunger Games Mockingjay Prop Replica Pin and the Portal Replica, are numbers 1 and 2 on Amazon’s Top 100 Best Sellers in Toys and Games list! The designers here at NECA work extremely hard to perfect the details in all of the products we make. With The Hunger Games having such a large and loyal fan base, it was extremely important to us to make something the fans can be proud of. We are happy to see that our Mockingjay Prop Replica Pin is Number 1 in Amazon’s Top 100 Best Seller in Toys and Games list, and has been in the top 100 for 48 days now! There is no real way to describe the awesomeness of our Aperture Science Handheld Portable Device. We allocated a decent amount to Amazon on Friday, and they were only able to begin taking pre-orders late that evening. By Saturday morning, the replica was sold out, reaching #2 in the Toys & Games best sellers list. We take pride in everything we create. Seeing any of our products on Amazon’s Top 100 list is amazing, but seeing two of our products take the number 1 and 2 spots is truly incredible.